Happy holidays from OCR! I am writing to spread some holiday cheer and also spread the word about a cool product produced by a local OC company, OC Outdoor Solar, and OCR member Brian Yanity. 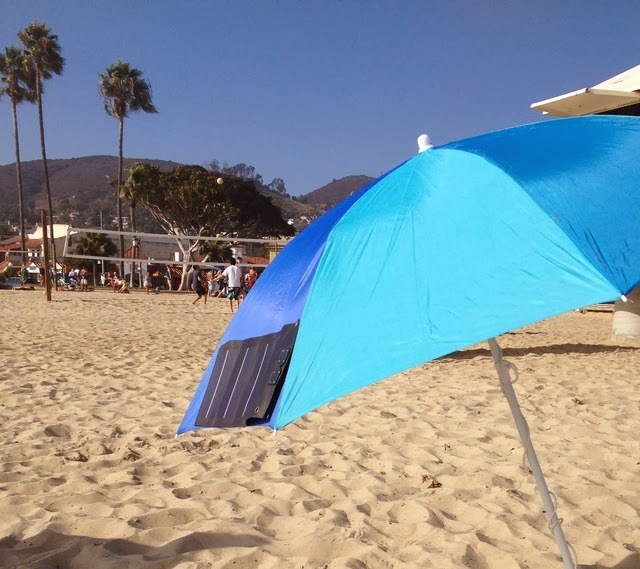 Brian has developed a beach umbrella / tent mountable flexible solar panel for charging your cellphone. Click on this link here to visit the website for more information and ordering instructions. Congrats to Solar Decathlon Team Austria! A quick congrats to first place winner Team Austria at this year's Solar Decathlon! The first ever Decathlon outside of Washington DC wrapped last night at the great park in Irvine and from all signs was a smashing success over the two week period. Even last night at 6:30pm the line to get into the Team Austria house was around the block! The line to get into the 2013 Decathlon winner, Team Austria, stretches around and around! Also, thanks to all who stopped by the OC Renewables / ASES booth in the SunShot Pavilion. It was great to see so many OC locals interested in learning more about renewable energy. We will be adding your email to our network list and contacting you soon about great events and opportunities for you to get involved with renewable energy in the OC. We need volunteers for the OC Renewables booth at Solar Decathlon 2013 this weekend! This is the final weekend for the DOE Solar Decathlon happening at the Great Park in Irvine. This weekend, OC Renewables / ASES will have a booth in the SunShot Innovations Pavilion and WE NEED VOLUNTEERS to man it! We will have free copies of Solar Today and free information about ASES Solar to distribute. Volunteers will be required to talk a little about clean tech in the OC, recommend visitors to join ASES and how to join the email list of OC Renewables. If you think you have some time to help out, please email Adam with the window you can attend. All times are available from Oct 10 - 13, from 11AM to 7PM. DOE Solar Decathlon 2013 has started! Come one, come all to the Irvine Great Park for the 2013 DOE Solar Decathlon, which started today! The event is free to the public and public viewing hours are 11am to 7pm on Oct 3 - 7 and Oct 10 -13. Some of you may ask.. "What is a solar decathlon? Is there any running involved on my part?" The answer is NO RUNNING, but quite a bit of walking as you tour "solar homes" that have been built by university teams around the world to compete for the top honors at this DOE sponsored annual competition. Visitors get to see the latest in sustainable design, architecture and thinking as they tour the homes and talked to the passionate students who built these wonderful displays. If you are a novice, it is great place to come and learn about all sorts of fun sustainability and renewable topics. If you are a seasoned expert, you get the see the latest and greatest in the field! This is the first year the event has been held outside of Washington DC, so lets show them what we're worth and get out to this event! Visit the decathlon website at this link for more info. DOE Solar Decathlon NEEDS volunteers! Let's get involved! Calling all OCRenewablers! If you don't already know, the US Department of Energy (DOE) is hosting this year's Solar Decathlon event right here in Orange County, at the Great Park in Irvine from October 3-13. This is a very big event, where students from all around the world build sustainable homes to compete against each other for top honors, and it is the first time it is being held outside of Washington DC. The website for the event is at this link, but the most important information is how you can get involved. The DOE needs volunteers for an assortment of activities during the two week run of the Decathlon. If you are in the Orange County region and want to get involved, then please click on this link here to go to the volunteer portion of the Decathlon website. Follow the instructions for signup and select which times / events you want to volunteer for. It is very easy, I've already done it, and feel free to ask me if you need help. "The U.S. Department of Energy Solar Decathlon 2013 and XPO would not be possible without the time and commitment of hundreds of volunteers. Their work supports and celebrates the remarkable student teams who bring their solar-powered houses and passion to the Solar Decathlon. This year, for the first time, this event is being hosted by the City of Irvine at the Orange County Great Park. Volunteers work alongside Solar Decathlon and XPO organizers in roles such as greeters, docents, runners, visitor liaisons, and more. Volunteer t-shirts are provided. To find out more and register, visit http://www.solardecathlon.gov/volunteers.html "
OCR is currently working to get a booth at the event to share information about ASES membership and answer any questions locals may have about getting more information about solar & energy efficiency in Orange County. When talking about the efficiency of PV modules, there are seemingly infinite numbers to talk about. First, there is the different types of modules, like c-Si, a-Si, CdTe, CIGS, CPV, on and on and on. Then, there is the different conditions under which efficiency is measured, like IEC 60904-3, ASTM G-173-03, IEC CSTC, on and on and on. It easy to understand how someone even working in solar would very easily get confused by all of these numbers, results, conditions and technologies. But there is one document that has taken the lead in organizing and presenting all of these different values in an attempt to present results on equal grounds. This is the perpetually published Solar Cell efficiency tables (currently on Version 41) by Martin A. Greene et al, which was last released in late 2012. About one to two times a year, a new version is published and all in the world of PV efficiency is clear, if even for a moment. I urge anyone with interest in the topic of PV technology and modules to review this document in its most current release and get a real sense for where efficiency currently resides in the PV world. I recently received a phone call from a landowner in Southern California who follows ASES and wanted to know more about how a landowner in the region can develop solar on their land, essentially creating their own lil "power plant". This is not my area of expertise in solar so my guidance at the time was fairly broad, to call one of many solar companies who install commercial / residential / utility scale solar and ask about the steps involved. This could be Sunpower, Hanwha, First Solar, ect. But I was intrigued by the inquiry and the idea of thousands of small plant across the CA landscape that I decided to keep an ear to the ground for any potential rumblings on the topic. Today I saw this article on GreenTechMedia. While its by no means a comprehensive guide to getting solar on your land, it does a good job of explaining the broad steps. What would be more interesting is actually seeing some calculations on the return of land with solar vs other types of development options with land. I am sure these number have changed drastically in the past several years, please let me know if anyone out there comes across anything! Reminder: BDR Earth Day Fun Run this SUNDAY! Just a friendly reminder of our post from March 19, OC Renewables is very excited to support this year's Brian D. Robertson (BDR) Earth Day Family Fun Run / 5k at Bolsa Chica State Park on Sunday, April 28, 2013. The race starts at 11AM and you can register at Active.com at this link here. You can register online at Active.com until Friday night at 9PM. I can confirm that there will be quite a few OCR peeps at the event, so we will see you there! Join us for an info session on the 2013 Cleantech Open Competition! Attention OCR community! Are you an entrepreneur with a big cleantech idea that addresses the planet’s most pressing energy, environmental or economic challenges? If so, please join OCR for an evening of stimulating conversation with leaders in the CleanTech sector hosted by local cleantech leader and longtime OCR participant Kyle Scrimgeour. Come learn about the local and regional organizations supporting enterprises that help make our world a better place, and how you can participate, including applying to the 2013 Cleantech Open Accelerator Competition for your chance to access world-class training, mentoring, funding and publicity, and prizes from $10,000 regionally to the $200,000 National Grand Prize. Application Deadline for the Accelerator is May 1, 2013, so you better get going! ATTENTION: GPS directions to the Duck Club are often wrong. The only entrance is from Campus Drive and Riparian View. For more information about the evening or Cleantech Open, please contact Kyle Scrimgeour at kyle@ecozen.org or (877)-316-1113. See you there! OC Renewables is very excited to support this year's Brian D. Robertson (BDR) Earth Day Family Fun Run / 5k at Bolsa Chica State Park on Sunday, April 28, 2013. The race starts at 11AM and you can register at Active.com at this link here. The BDR Earth Day Family Fun Run is one of the primary sources of charitable donations for the Brian D. Robertson Foundation and The BDR Solar Schools Fund. The Brian D. Robertson Memorial Solar Schools Fund was created to introduce students to solar power by having a total of 20,000 solar energy systems installed at K-12 schools across the nation by 2020. The “20/20 Vision of Solar in America”™ will put solar electricity within reach of millions of students across the country – a goal that embodies Brian’s belief that education is critical for developing a green energy economy and strengthening our nation’s future. The Brian D. Robertson Foundation was established by the Robertson family to support organizations that have a positive impact on the environment and that promote family wellness. The foundation is committed to putting the resources raised by the donors back into the local communities from which they came. Brian Robertson was a dedicated family man serving as father, husband, son and brother. He was also an incredibly talented serial entrepreneur and business leader—a true solar pioneer and visionary. At the time of his death, he was the Chief Executive Officer at Amonix, Inc., a company specializing in the design and manufacture of utility-scale solar power systems, headquartered in Seal Beach, CA. Brian died in a plane crash on December 22, 2011 at the age of 38. OC Renewables is talking a moment to recognize the great work of local Long Beach Polytechnic High School students and friends of OCR, Destin Bigsby, Carl Olson, Kieran Reiser for the strong finish of their "mini-documentary" video in C-SPAN's annual StudentCam competition. Their video finished 3rd out of nearly 2000 submissions with a strong message of support for expanding renewable energy across the country. As part of their award, their video will be air at 6:50am EDT on April 4, 2013 on C-SPAN. Congrats again to Destin, Carl and Kieran! Keep up the great work and the great message! Greetings fellow OCR-ers! I am writing you today with an update on OCR and to spread some excitement about our organization in this new year. Late last year, the board of OCR decided to make a few changes to the organization to preserve the elements that we've worked hard over the last several years to build while respecting the hustle and bustle of our daily lives. The outcome of these changes should be a more flexible, leaner OCR that is ready to support renewable energy and energy efficiency technology through 2013 and beyond. Lets take a minute to review the new OCR. First, we will of course continue to be the official local chapter of the American Solar Energy Society and your local gateway to a national ASES membership and benefits. Second, our Associated Director Mike Kilroy will continue to bring great renewable themed news and info to our audience through our Twitter feed, our Facebook page and posts at our website. Third, we will continue to nurture and build our great network of clean tech enthusiasts that we have throughout Orange County. Fourth, we will support several great annual events that we have been known for over the past years (see what we have in store for 2013 below). Last and most importantly, we will continue to evaluate partnership opportunities with other organizations and events on a case by case basis and are excited to see where this approach can take us and our membership. This could include anything from a presentation at a local venue by a special guest or partnering with a sister organization for a green-themed event, like a solar-homes tour. Thanks to all who continue to support OCR, we hope you are as excited about the new OCR as we are. Please do not hesitate to reach out to us via the email link and the bottom of the page or the form on our membership page, especially if you have partnership opportunities for the organization. Adam P & Mike K., Mike H., Yair and Dr. Lori.